Caveat emptor, let the buyer beware, is a traditional marketplace warning. It cautions a person to be very careful about what is being purchased, and many people are. They will hedge their bets so to speak by buying a warranty. This covers the cost of repair, but even this has a cautionary note. There are those who will not honor the warranty. It is why a group legal plan needs to consider warranties and consumer protection. 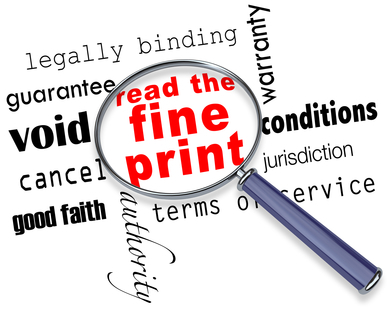 The legal language of the warranty is used by unscrupulous merchants to disguise intent. These people claim that the warranty cannot be honored because of a given clause within the original document. If you are not a lawyer, it’s hard to understand what is being noted in the warranty. Excellent service will allow you to have access to an attorney within the group legal plan. Countrywide Pre-Paid Legal Services provides this kind of benefits option. Any plan member who is suspicious of how the warranty is being interpreted can get in touch with a Countrywide lawyer. Our nationwide network of legal professionals makes it easy to set up a face-to-face consultation. The attorney can advise a person about what the warranty means. Individual can then return to the merchant with this knowledge. If the other party refuses to honor the warranty, other pre-paid legal services can come into play. A Countrywide group legal plan is a very comprehensive benefit. The services complement each other and help solve problems. The Countrywide lawyer can write correspondence on behalf of the plan member, and this can be directed towards the reluctant merchant. Also, the attorney can advise a plan member on how to best go about filing a consumer complaint. Telephone calls to the other party are part of the bargain. All of this can convince the other side that honoring the warranty is the best course of action. Getting this kind of resolution quickly may not be possible unless an attorney is involved. Employers realize that problems outside of the workplace can affect productivity in the cubicles. These forward-thinking decision-makers want to provide excellent benefits to relieve any employee anxiety. However, it is important to get the best benefits for the money. Countrywide group legal plan benefits provide a sizable number of options. Each one of these is intended to assist a plan member in dealing with the most common legal issues. Matters such as drafting a will, dealing with public agencies, and even preparing a Small Claims court case are among the options which can be part of the plan. Countrywide believes an employer has a good understanding of what the workforce wants and needs. While we do have several benefit possibilities, not all of them are right for the staff. We permit our clients to look at all our options and decide which ones are going to be in the plan. It assures the client that the Countrywide Pre-Paid Legal Services benefit is going to be used by as many employees as possible. Our administration is meant to be proactive; nobody must sit and wait for services. What we have to offer solves problems and boosts the morale on the work floor. We have worked with all kinds of organizations since 1987, and our experience allows us to provide the very best.